Dr. Douglas E Mazzuca Jr, DO is a Doctor primarily located in Pennsville, NJ. He has 36 years of experience. His specialties include Ophthalmology. He speaks English. Dr. Mazzuca has received 3 awards. The overall average patient rating of Dr. Douglas E Mazzuca Jr is Excellent. Dr. Douglas E Mazzuca Jr has been rated by 8 patients. From those 8 patients 2 of those left a comment along with their rating. The overall rating for Dr. Douglas E Mazzuca Jr is 4.9 of 5.0 stars. Dr Mazzuca performed a laser vision correction surgery called epi-lasik. I have been a contact/glasses wearer for years and decided to get lasik. Due to my lifestyle and other reasons I chose epi-lasik (look it up for details). His skill speaks for itself - 3 months after the procedure I see 20/10!!! He is very attentive and kind. I had multiple pre-op appointments and many follow up to make sure I was coming along correctly. This was important - He identified a side effect eye drop meds and took care of it. I experienced no pain - during or after the surgery w/ no pain meds. This procedure takes time to completely heal but is worth it. You could not choose a better doc work with. 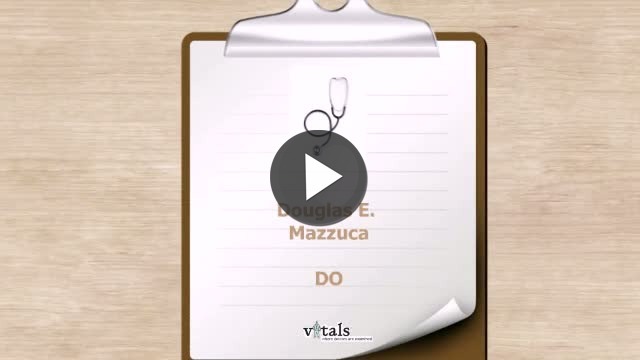 Take a minute to learn about Dr. Douglas E Mazzuca Jr, DO - Ophthalmology in Pennsville, NJ, in this video. Dr. Douglas E Mazzuca Jr is similar to the following 4 Doctors near Pennsville, NJ. Have you had a recent visit with Dr. Douglas E Mazzuca Jr? Select a star to let us know how it was.